. The boys are thinking more like v7/8, but with it’s very tall nature and not exactly flat landing it’s not really about the grade. Do this climb and it will make your day. Be very careful on the fragile knobs as you top out this monster problem and bring lots of pads and spotters! 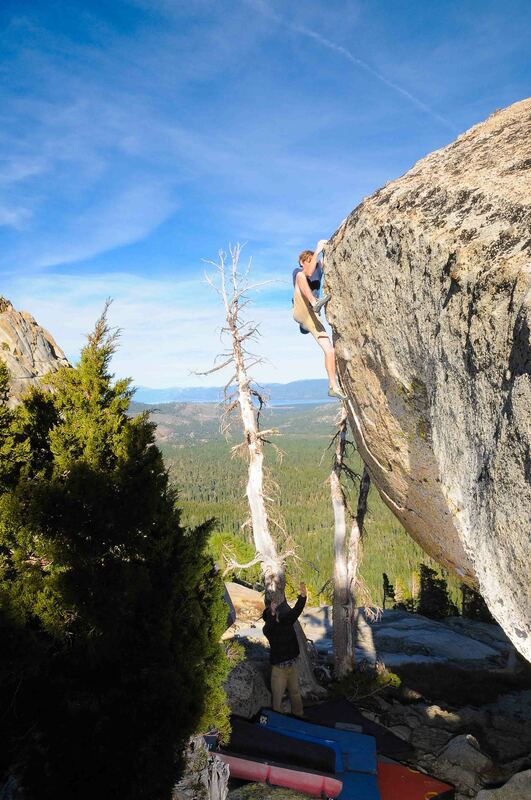 During the first week of November Seth Carter took my brother and I to Soda Springs to check out this highball arête he had scoped. The boulder is 5 minutes further down the road past the main area and most of the lines had been climbed previously by Paul Otis, except the arête and a few other lines. We started with a few super tall v2ish slabs on the front face which got or heads in the game. 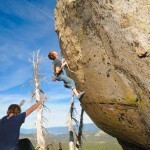 Then Seth took down the arête with ease as usuall. It’s about v7 and calld “Wild Stallion.” With a sloper landing and highball factor it’s no gimme. I like highballs, and after about 1/2 way up I didn’t feel like going any higher. There are a lot of other boulders Paul has climbed on in the vicinity and they will be featured in the 2nd edition to the NW guide. A few days later we went to the Sierra Buttes lookout armed with a rope, in hopes of checking out and sending an amazing 25 ft tall overhanging wall with several lines. It’s so epic!! Dave Ficher and crew got a little ways up this rig several years ago, but it proved to be to much without rope inspection. Anyways, the road was snowed in and we vowed to return in the spring with Seth in tow, to hopefully shed some light on this super tall wall. 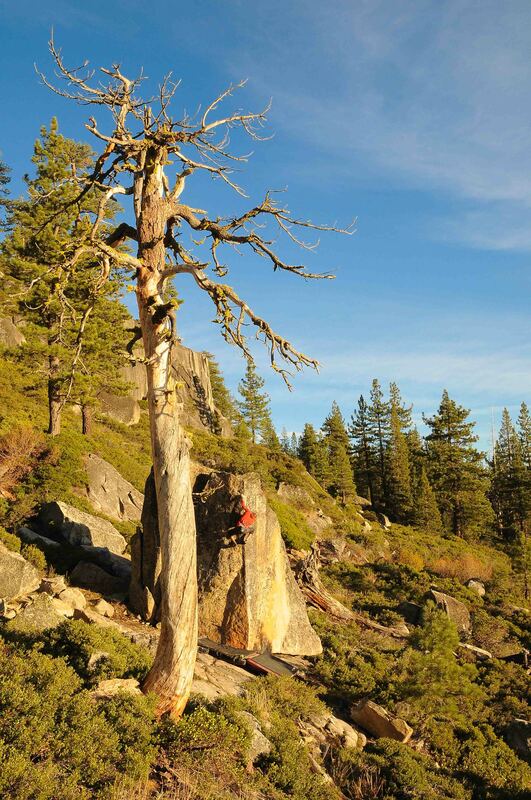 On the way home we stopped on Yuba Pass and developed this really cool roadside boulder I had looked at with Kyle O’Meara a few years ago. It panned out nicely, with about 10 lines from vb to v6, including a few 3 star problems. Shane Carignan gave me a tour of “God’s Country” for the Outlying Guide. My first question upon arrival was “what about this arête?” He said they didn’t do it, so I quickly went to work cleaning it up. It eneded up being a great 3 star v6 and we both agreed it kinda made this small zone well worth the visit. We named it “Godsend,” and it’s pretty much the perfect boulder problem, just the right height and well featured with fun moves. And to wrap up the month, yet another new area starting getting developed. The area is is near south lake and it starting getting action from Billy Potts and friends. 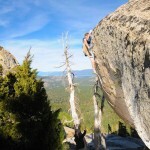 Upon finding the zone, Billy found only 1 boulder on the way in to the boulderfield had been climbed on. 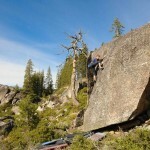 So he quickly put together a crew and added many fine lines on untouched boulders. Look for more info on this new spot in the spring after they put in some more time up there. 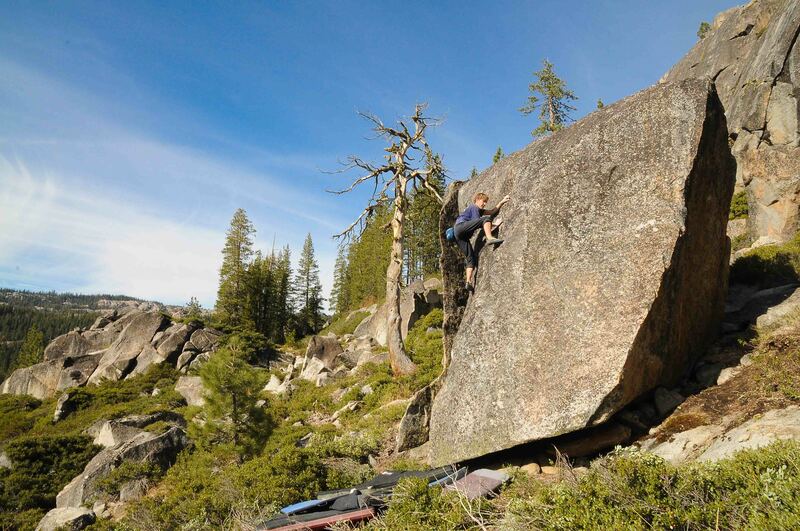 Will there ever be and end to this seemingly endless supply of new boulders? Several key holds have broken on classic climbs!! Almost all the holds broke the day after a rain storm. For those who don’t know, holds are much more fragile just after a rain, especially sandstone. Please use common sense and don’t climb on weak or fragile holds just after a rain. 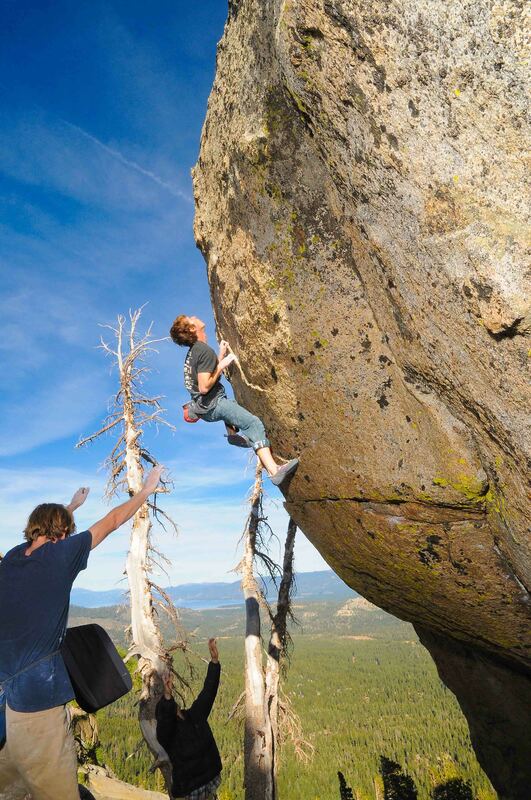 If you must climb, stick to solid lines with no suspect holds, slabs, compression, etc… The future of boulder problems is in your hands, literally. This is what has broken so far: On the “Cave Boulder” at Middle Bliss route # 5 lost its “Cutter Edge” and no longer goes, it’s ruined. This happened the morning after a rain. At Burnside Lake “Lucid Dream” v8 on the “Lucid Dream Wall” lost a key hold and its going to be way, way harder, as there isn’t to many other options. Again, the day after a rain. 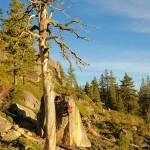 At the Beavers, the mega classic “Race Against Time” v6 lost a really cool jug hold. This hold kinda made it all flow real nice. Dustin Sabo did do it after it broke at v8sih and the word is not out yet on if it’s a better or worse climb, time will tell, depending on who you talk to…Again, the day after a rain. Warren Digness told me they were climbing on “Rouge Wave” v6 at the Firestones the day after a rain last year and the small footholds at the start were just blowing apart so they stopped before any more damage. Let’s hope this will serve as a bit of a wake up call to all of us. Luckily no one was hurt during any of these breakages.